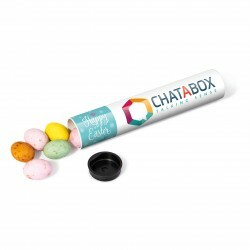 Whether it’s Easter, Valentine’s Day or any other important time of the year, if you want to provide your customers, clients or employees with custom seasonal sweets, we’ve got a huge range that you can explore right here today. 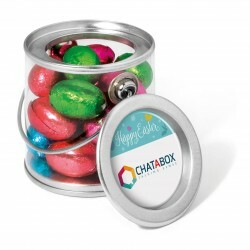 For the best range of fun promotional products, UK businesses can find exactly what they are looking for at any time of year, so search our range today and stock up on branded sweets to help with your promotions. We have a huge range of treats right here on our website for you to choose from. Our affordable branded food and drink items are some of the most popular products for our customers, and we want to make sure you can find exactly what you are looking for. 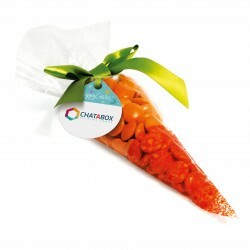 You might be looking for a small bag of chocolate eggs for Easter or something a bit more unusual like our Easter Carrot Bag. 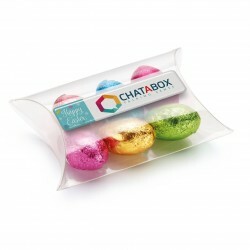 From tiny tubes of chocolate to large buckets of chocolate eggs, we’ve got it all. So whatever type of campaign you are running, we have got what you need. When Easter comes around, it’s all about chocolate! 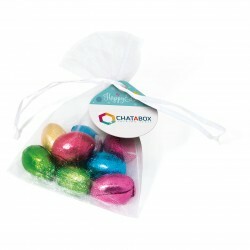 Give your customers, clients and dealers exactly what they want in the form of chocolate eggs. These are a great way to say thank you or simply to make someone’s day. And you can explore our range of delicious corporate chocolate for even more options. Chocolate is always popular at trade shows and industry events. 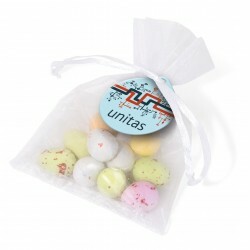 If you are running an event with a seasonal theme, our printed seasonal sweets will be perfect. 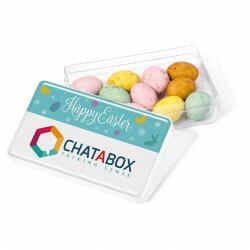 Alternatively, if you are involved in any seasonal events, such as a charity event, or you are carrying out some PR campaigns linked to Easter, you might find that these branded items are just what you are looking for. Our aim is to make sure that you can find exactly what you want for any promotional campaign quickly and easily. That’s why we provide everything in our store from printed chocolate to cheap branded clothing. Our prices can’t be beaten. Our UK-based company stocks an extensive range of products from suppliers all over Europe that are often hard to find anywhere else, and especially at our low prices. What’s more, we make the experience easy for you. Our experienced account managers are here when you need them to help you with your orders. Whether you want to order a free sample with your branding printed on it so you can tell how it looks or you just need some help with your order. So explore our seasonal sweets today and find what you are looking for, then make your next promotion one that everyone will remember.